[Updated] The “distasteful and offensive verbiage” of one Minister “coupled with the refusal to apologise for his own offensive remarks” by another Minister, shows a “Government that is becoming unhinged and unfocused,” Party Whip and Shadow Minister of Education Lovitta Foggo said. Ms Foggo’s comments follow after Friday’s session of the House of Assembly, in which Minister Sylvan Richards was ejected from the House, and Minister Patricia Gordon-Pamplin, while describing what someone said to her, used a profane word, a comment she subsequently withdrew. 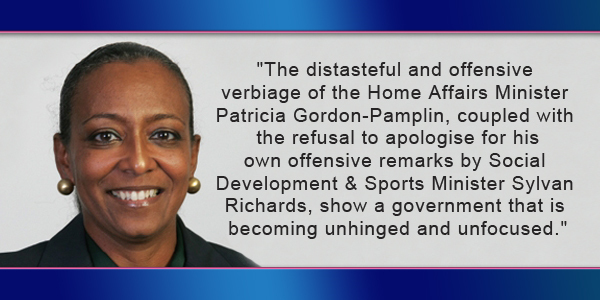 “The distasteful and offensive verbiage of the Home Affairs Minister Patricia Gordon-Pamplin, coupled with the refusal to apologise for his own offensive remarks by Social Development & Sports Minister Sylvan Richards, show a government that is becoming unhinged and unfocused,” Ms Foggo said. “Premier Dunkley needs to enforce the proper decorum from his Cabinet and MPs when debating in the House of Assembly. “We all understand that things can get heated in the House of Assembly, however there is no excusing the way Minister Gordon-Pamplin shouted profane language on Friday night, regardless of the context in which they were used. “There could have been young people listening and that language is not one which should be associated with a senior political stateswoman. “Minister Richards’ outburst to MP Lawrence Scott, that ‘he deserved to be pepper sprayed’, shows a Minister that is hopelessly out of touch with his community. “In making those disparaging remarks, he has told all protesters injured on December 2nd that they deserved what they got. “Clearly this statement is at odds with the behavior of two OBA Cabinet Ministers on Friday night, and we expect Premier Dunkley to condemn their behavior,” concluded Ms Foggo. Update Feb 6, 8.11am: In response, Minister Gordon-Pamplin said, “MP Foggo’s comment ‘regardless of the context’ confirms that she and her colleagues will follow the playbook set out by their former leader to spread misinformation to regain power by any means necessary. She said a bad word?!?! I’m still waiting for the opposition to make a statement on the comment of “people showing up with guns” during the December protests…. But God forbid she reiterated words said by a member of the public…. reiterated words that were spewed by a PLP supporter nonetheless. Can’t blame them though as they simply follow the lead that the PLP set. Hatred and intolerance. Sit back Eat Popcorn, and take a look back at Marc Beans attack which were far worse, your responses to that attack and statements made by the PLP. You must be new here. That’s why Mark is not here. You are right. Can we obtain D.B.’s phone records under the PATI thing-a-ma-jig? We haven’t forgotten the ‘ten cent w….’ remark either. That wasn’t said in the house. So what….it was utterly distasteful and offensive. Do you agree? It was said at a Polling Place. Much less than a year ago he was your leader and apparently had the full support of the party. Now he has been kicked to the curb and is no longer in the PLP??? Really? That is hardly an endorsement of the PLP. It’s a shame that all of this outrage is being directed at Patricia Gordon-Pamplin for repeating what someone referred to her as and not at the person who actually said it!! A good many use that language on a regular, and I find it offensive at all times, but for many it seems to be only offensive when the story is being retold “in the house”. Certainly the outrage is being misdirected…or maybe not considering who is doing the directing. How can you condemn someone you don’t know. All we have is her version/word. We don’t even know if she is telling the truth. Could have made it all up for shock value. Same could be said of the PLP/UBP! your point is mute..
Say what sounds just like the plp s mantra no truth and pure shock value by the way where,s the missing 800 million we could really use it right now ? Mp foggo you are a disgrace the only reason your up in st David’s is because the plp sent hundreds to live there real st David islanders would never vote for you. Mrs Foggo and her suddenly prudish ears. Who gives a @#c$ get back to work! Could not wait for Monday could you Ms Foggo. Yup she was completely wrong Ms.Foggo. Now are you going to condemn the language used to a Government Minister as she approached the House. If the Police would have heard him and approached him about his language, he might have acted up and got Pepper sprayed. I bet you would have been all over that right? F’n b!t.ch is an adjective and a noun. No verbs at all. Each and everyone of you should be ashamed of yourselves. You all act like spoiled children focusing on your own selfish silly political causes. Get a grip and begin to focus on the issues of this country. Disgraceful the whole lot of you!! No we deserve what we vote for. If you have a problem with the Government, take a look in the mirror. You put them there. Bermuda is dead broke because of voters of the calibre that shouted disgusting language at the Minister who is one of the best politicians we have. Did the $800 million show up yet? Guess she forgot about that time her former party used worst language against members of the house. Because they aren’t Bermudians. They don’t care about the “locals”. Not like Micro was lying lmfao…I can’t attest to all the others but I’m a Born Bermudian! For all I know you could be expats trying to rile people up. The only “locals” would have been the Portuguese/Spanish/Pigs! I actually am Bermudian and have in the past voted for UBP, PLP and OBA in the past. I don’t play the “PLP or OBA For Life” game that many people play. That kind of mentality never ensures that we get the best people in government…just the best that any particular party can put forward at that time. I don’t listen to the BS political game about what he or she are going to do if elected. I ask myself, a) did the current government leave the country in a better position after their 4-5 years than when they took over or are we worse off. I look at the economy, national debt, tourism arrivals, international business, employment numbers, education, social environment and more. I’m sorry, but there is no arguing that the PLP left this country in a far worse state (in most categories) than when they took over. There is no arguing that the OBA has reversed many of those same trends. Are they perfect- No. Is there any such thing as perfect – No! Are they better – Yes! Just because I don’t agree with you – doesn’t mean that I am not Bermudian. Just means I have the ability to block out the noise, look at the facts and make my own decisions. Sometimes I may agree with you, and sometimes I won’t. That is life my friend. and b) is what the opposition / and government saying that they will do and how one should act a true reflection of what they have done and what they have themselves said in the past. What honour do you bring, you critize a person for asking a valid question that calls into question the validity of the MP’s statement… and your response is to call the blogger ‘nasty’ and ‘despicable’ and point fingers at the OBA supporters. The fact is there are those on both sides responsible for bad mouthing the other side, and frankly there is nothing in Micros post that even remotely calls anyone names or bad mouthing them. Watching the likes and dislikes shows that there is another click farm campaign again though. Seems to be around 50 – 60 block user purchase too, in the multiples of. You and your beloved plp would not know honor if it bit you on the a#s where’s the missing 800 million and you talk about despicable and shameful well you would know. I suppose all the words that Beanie used were always nice. Plp give it a break. Your group were far from perfect. When did The Opposition leader ever use profanity in the House? Did the Minister use the actual words or just insinuated what was said? I just want clarification. Short memory of her former party leader… seriously, shouldn’t they at least apologize for all the bad decorum they conducted in the House before they try to be pious over the government’s bad behaviour… also, can they explain why PLP MP’s are saying they were pepper sprayed, after the PLP denied being party to blockading the House. If they were pepper sprayed or even caught within the pepper spray over spray, that would indicate that they were well within the front line of the blockade action. More BS from a PLP crony! Ms. Foggo, although I’m a PLP supporter I’ve lost respect for you for making an issue out of Minister Gordon-Pamplin’s words. She was quoting verbatim what she heard, so why make a big fuss over it? My mother always taught me to pick my battles, and to me this is a non-issue. We know you didn’t vote PLP. Now good luck next election. Personally ,,,I think these people who hide behind assumed ,,,names or,,,non de plume,,,as they are called,,,,are cowards.There is one blogger who calls himself,,,or herself,,,The sherriff,,,,,,..I would love to meet this vile piece of trash in the street face to face,,,or maybe I have,,,,hard to tell nowadays….Hi.! You are all about peace and love until someone disagrees with you. Then you turn to threats. Must be the foreign influence. How do I know that’s your real name? Unless a photo is attached, there’s really no way to know if any person here is posting under their real name. But you continue to support the PLP after they put us over a billion in debt, and lets not forget the 800 mil that is unaccounted for? After Jetgate you made lots of noise and called for the Premiere to resign, but went quiet after it was uncovered that Dr Brown did the very same thing… but why? You were quiet when Marc made is comments (AS YOUR LEADER)but have a huge problem now. Who is a die hard supporter???? I would switch parties in a heartbeat if I ever felt that the current government were not the best option. But, for now at least – they clearly are. Looks like u just spat out the definition of a die hard plp supporter to me. Goes both ways u know. Unhinged and unfocused coming out of the PLP MOUTHS. Imagine that. How one easily forget’s. Please MP Foggo. Take a break. While i do not support what Minister Gordon-Pamplin did, you seem to have forgotten the sins of your own Party. Like one commentator said ‘you couldn’t wait for Monday’. You all need think before you speak. Yes, this country deserves better than the lot of you! It amazing how much time is wasted on the petty things. There are a lot of pressing issues to be dealt with. I personally do no feel that I am getting value the money being spent for those representing the people. Looks like a mass notice went out for all the faithful to dislike anything anti PLP. Puppets. you are a true idiot and your party is on the way out. Hey shuttemdown we the taxpayers are the idiots for not demanding the return or our 800 million that’s what we should be marching and protesting about. Actually my people are tired of the UBP/OBA and all the bs they bring into the people’s house. Hey game over return the 800 million Now. I will give the PLP one thing. They are darn good at making small insignificant stuff seem like the world is coming to an end when it comes to the OBA. But the most funny/hypocritical thing of all is how they dance around the fact that they spent every last cent Bermuda made and then some! We can not allow them to ignore this simple fact all the while hammering on about such insignificant s..t! Does shouting “There’s guys with ammunition and you don’t want them to come” to police officers in middle of an emotionally charged protest qualify as offensive or fair comment?